June 4 (Friday) at Le Vin en Tête Saint-Placide: Tasting Côtes de Duras with the winemaker from Chateau Haut-Lavigne (free). From 6:30-9pm at 53 rue Saint-Placide, 75006. June 6 (Sunday) at Le Vin en Tête Saint-Placide: Inauguration party to celebrate the opening of this new location. Tastings with many different winemakers (free). From 10am-9pm at 53 rue Saint-Placide, 75006. June 3 (Thursday) at Spring Boutique: Wine Games – a blind tasting challenge every Thursday from 5-9pm (€5). June 3 (Thursday) at Ô Chateau: Wine and cheese lunch at 12pm (€75), French Wine Introductory at 3pm (€30), and Grand Crus Tasting at 5pm (€95). All events at 52 rue de l’Arbre Sec, 75001. June 4 (Friday) at Ô Chateau: Wine and cheese lunch at 12pm (€75) and Tour de France of Wine at 5pm (€75). All events at 52 rue de l’Arbre Sec, 75001. June 5 (Saturday) at Versant Vins: “les Maitresses de Chai” tasting with 14 female winemakers from all over France (€10). From 10:30am-7:30pm inside the Marché des Enfants Rouges at 139 rue de Bretagne, 75003. June 5 (Saturday) at Ô Chateau: Wine and cheese lunch at 12pm (€75) at 52 rue de l’Arbre Sec, 75001. 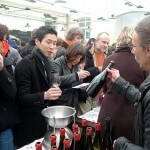 June 6 (Sunday) at Versant Vins: “les Maitresses de Chai” tasting with 14 female winemakers from all over France (€10). From 10:30am-4pm inside the Marché des Enfants Rouges at 139 rue de Bretagne, 75003. June 7 (Monday) at Ô Chateau: Wine and cheese lunch at 12pm (€75), French Wine Introductory at 3pm (€30), Grand Crus Tasting at 5pm (€95), Champagne Cruise on the Seine River at 6:30pm (€95) and Wine Tasting Dinner at 8:15pm (€130). All events (except the river cruise) at 52 rue de l’Arbre Sec, 75001. June 8 (Tuesday) at Ô Chateau: Wine and cheese lunch at 12pm (€75), Wine and Chocolate Tasting at 2:30pm (€65), Grand Crus Tasting at 5pm (€95) and Champagne Cruise on the Seine River at 6:30pm (€95) and Wine Tasting Dinner at 8:15pm (€130). All events (except the river cruise) at 52 rue de l’Arbre Sec, 75001. June 9 (Wednesday) at Ô Chateau: Wine and cheese lunch at 12pm (€75), French Wine Introductory at 3pm (€30), Tour de France of Wine at 5pm (€75) and Champagne Cruise on the Seine River at 6:30pm (€95) and Wine Tasting Dinner at 8:15pm (€130). All events (except the river cruise) at 52 rue de l’Arbre Sec, 75001. Looking for something later on? Check our full list of Paris Wine Tastings. Meg Zimbeck, Barbra Austin, Phyllis Flick and Sharon Bowman all contributed information for this post.